Perfect for even the most sensitive skin–glycerin and alcohol free. Formulated with fresh leaf extract and oil of Bitter Orange. This soothing toning lotion with its light natural aroma instantly gives a feeling of freshness and comfort. It balances the skin and eliminates all traces of impurities, ensures a perfect skin condition and prepares the skin for the action of other PHYT’S products. Recommended for normal to dry or sensitive skin. 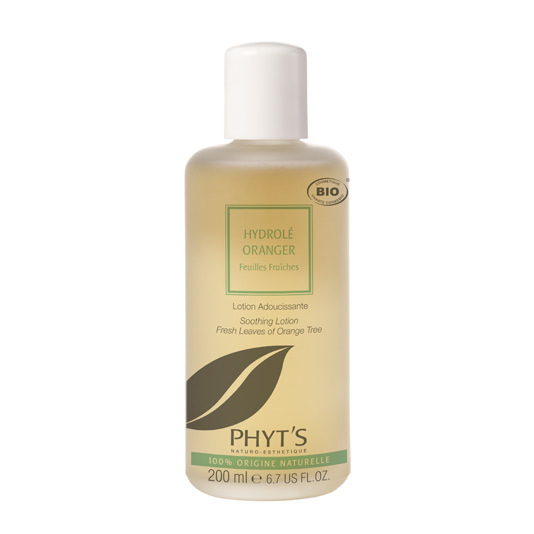 Shake the bottle before each use and then soak a cotton pad with Hydrolé Oranger. Gently and thoroughly wipe the face and neck area. Allow to dry naturally. Follow with your PHYTS skin care routine.